Canadian drivers love their hatchbacks – and they also love to spend money on them, too. It might seem unusual for a subcompact hatch like the 2014 Nissan Versa Note to crib high tech equipment from pricier siblings like the Altima sedan, but that’s just what has happened to the Japanese brand’s redesigned entry-level five-door as product planners have keyed in to our country's tendency to tick off all of the boxes on a small car's options sheet. Along the way, the redesigned vehicle has also gained fresh styling, a smaller footprint, and a new engine that brings it in line with the rest of the Versa family. I had the chance to drive the new Versa Note in San Diego, California, this past week and found that the hatchback makes a reasonable argument for the dollars of first-time buyers who might have instead picked up a used car. Adding luxury features to what is the least-expensive hatchback on the market doesn’t elevate it to premium status, but that’s not the point, really. Nissan knows that it can’t hide the black plastics on the dash and door panels with an available touchscreen navigation system, nor can it disguise the workaday trappings of the car’s knobs and buttons with the car’s optional Around View monitor, which gives driver’s a bird’s eye look at the area on all sides of the car while parking (a system so effective that I was able to reverse into a parking spot with all the windows of my test vehicle blacked out). The car’s heated seats, however (which are standard on the range-topping SL trim level) are a blessing for our frigid winters. Regardless of what you choose to pay for the 2014 Nissan Versa Note, all buyers will enjoy a passenger compartment that pushes the limits of what is to be expected from a subcompact car. The hatchback boasts class-leading cargo room with its back seat folded forward (and comes with a new Divide-N-Hide height-adjustable floor system for the hatch), and it can also claim the top spot when it comes to rear leg room. The car’s driving position is good, although thick A-pillars make themselves known by taking up a fair bit of forward-viewing real estate. The Versa Note also offers a calm, comfortable, and composed ride as long as one fights off the temptation to thrash the car around corners to hear the squeal of its low-rolling resistance tires. The 2014 Nissan Versa Note’s drivetrain is the very definition of simplicity, swapping in the 1.6-liter, four-cylinder mill from the Versa sedan in place of the previous model’s 1.8-liter mill. Don’t look for MSRP-boosting technologies like direct fuel injection in the Versa Note, as the manufacturer has elected to maintain its status as a price leader by keeping power modest and leveraging decades of investment in continuously-variable automatic transmission technology to keep the hatchback competitive in the fuel efficiency sweepstakes. The strategy works, with a new CVT helping the Versa Note post 5.5 l / 100 km in combined city and highway consumption. You won't be pinned to your seat in the process, however, as the Nissan’s 109 horsepower and 107 lb-ft of torque are low even for the subcompact segment. During my time with the car, the CVT’s performance was marred only by a slight hesitation at low speeds when changing momentum around a corner or up a grade. A five-speed manual transmission is also available with all versions of the Versa Note, but you won't benefit from the same level fuel savings if you don’t opt to pay more for the autobox. 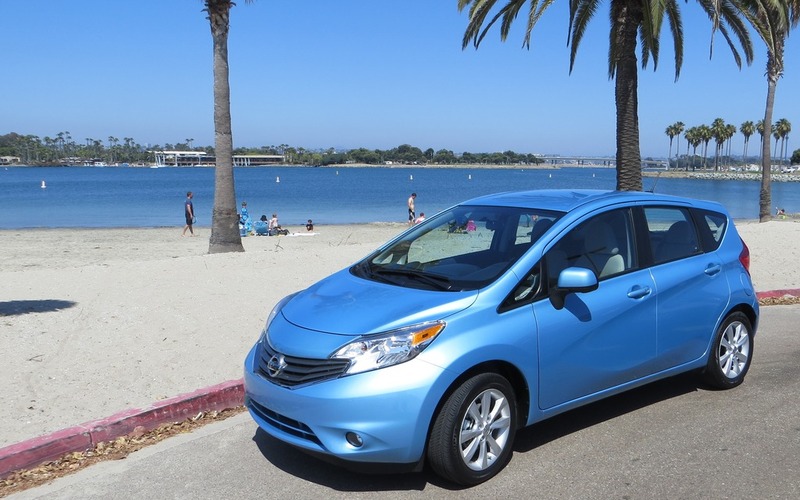 Does it make sense to 'damn the torpedoes' on the 2014 Nissan Versa Note’s options? Not really. Despite sticking on the right side of affordable even when loaded to the gills with gear, the Versa Note remains more compelling as an entry-level or mid-tier subcompact. Embrace the simplicity inherent in the hatchback’s straightforward design and presentation, and buyers could do worse when shopping for a second vehicle or efficient commuter. The redesigned 2014 Nissan Versa Note hangs on to the niche carved out by its Versa hatch predecessor as the cheap car that won’t instantly trigger buyer’s remorse on the trip home from the dealership. Technology/Autonomous Vehicles Never Clean Your car Again!